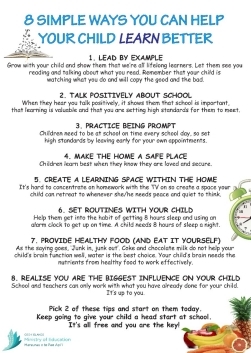 The use of posters in the classroom environment can support visual learners. Visual learners associate information with images or graphics. This means that they process information more effectively when they can see it. 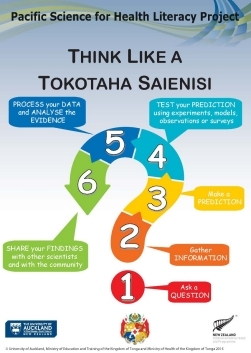 The Pacific Science for Health Literacy Project (PSHLP) has developed a series of classroom posters that are designed to support the overall learning goals associated with the project, and stimulate learning for visual learners. These posters are available to download and print from this page. The files are available in a range of sizes to suit varying printing needs. Links to associated learning resources are found with each poster. 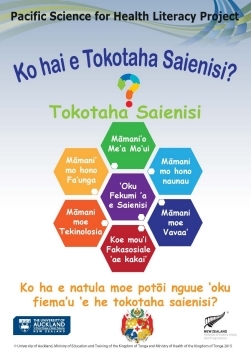 The posters are currently available in English, Cook Islands Maori and Tongan. Groups interested in translating the posters into other languages should contact LENScience. 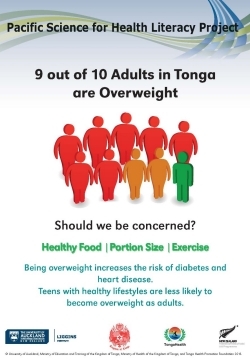 Schools in Tonga should contact the Tonga Health Foundation to access a stock of laminated posters available to schools. Secondary schools in Rarotonga have all been supplied with sets of these posters. 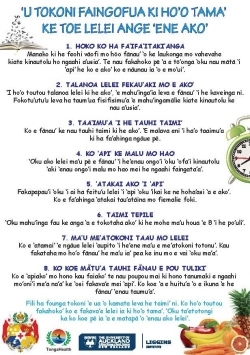 For further copies, or copies for schools elsewhere in the Cook Islands, please discuss your needs with the Cook Islands Ministry of Education. 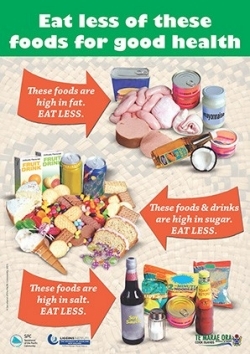 The PSHLP project team acknowledge the support of the Secretariat of the Pacific Community in sharing some of their posters for use in classrooms. 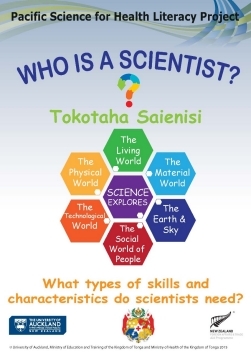 » Who is a Scientist? | Ko hai e Tokotaha Saienisi? The Pacific Science for Health Literacy Project promotes a holistic model of wellbeing that encompasses complete physical, mental, spiritual and cultural wellbeing. 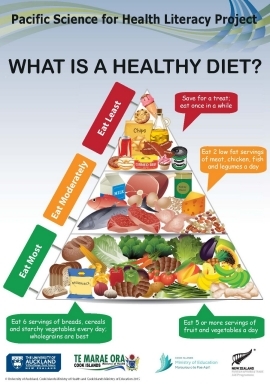 This links to the World Health Organization's definition of health as 'a state of complete physical, mental and social health and not merely the absence of disease or infirmity' (WHO, 2003). Learning programmes explore these concepts, including looking at values that are essential to supporting optimal health and wellbeing in a community. 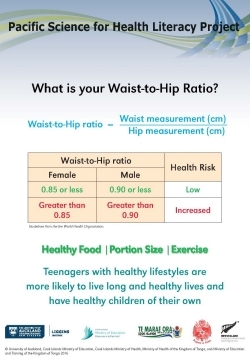 Students in the middle school (Years 7 - 10) explore perceptions of different groups within the community regarding what it means to be healthy and well. This encourages learners to identify their own thinking, as well as allowing them to explore the thinking of others regarding this concept. Learning resources support students to undertake research in their family, school, or community to explore these concepts. 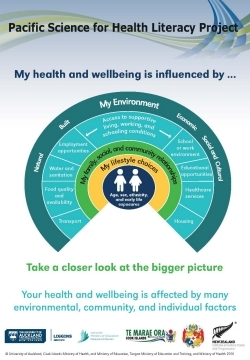 Students in the senior secondary school (Year 11) add further depth by engaging in learning that examines concepts of socio-ecological determinants of health and wellbeing, and explore concepts of social inequity associated with health and wellbeing. 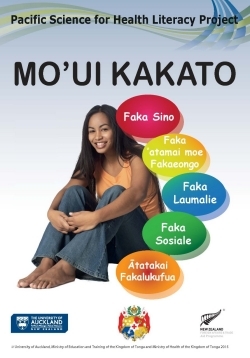 Downloads are available in Cook Islands Māori, Tongan and English. For printing at A2, A1 or A0 please download the 'FULL SIZE' version which has print marks for commercial printing. The 'SMALL' version does not have print marks and is suitable for A3 colour printing. LENScience programmes explore a life course approach to health and wellbeing, identifying that factors throughout the life course influence health and wellbeing in an ongoing manner. In particular, our programmes facilitate exploration of evidence that environmental factors experienced in early life impact health and wellbeing throughout life. The Healthy Start to Life learning programmes (including those within PSHLP) promote opportunities for young people to explore evidence about the non-communicable disease crisis from a range of perspectives. In the general media, an incorrect message about the NCD crisis that is often portrayed is that of individual blame. 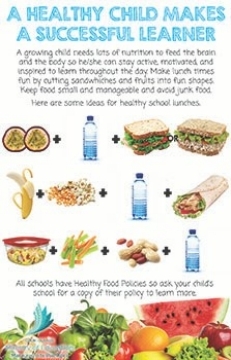 The Healthy Start to Life prorgammes work to engage students in learning that challenges this frame of reference and promotes the concept of socio-ecological determinants of health and wellbeing. 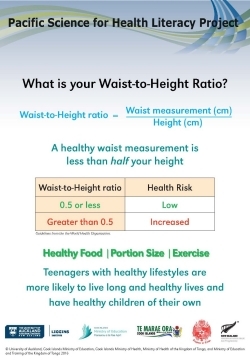 In particular, the Year 11 programmes exploring type 2 diabetes as an issue affecting communities see 15-year old students examining this concept. Research evidence from evaluation of these prorgrammes shows that the learning experiences promote the development of awareness of socio-ecological determinants of health and wellbeing in young people. Downloads are available in English. 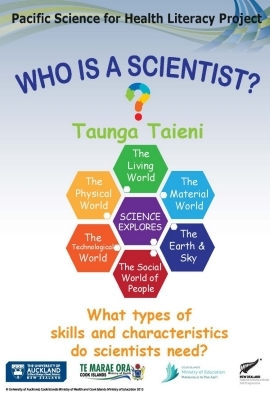 Who is a Scientist? | Ko hai e Tokotaha Saienisi? Science, like any human activity, has a culture of its own. This culture is influenced by the people and organisations that are engaging in science, and will differ from place to place. Opportunities to examine who scientists are, what they do, and the culture of science are embedded throughout the LENScience programmes. These include narratives about scientists and their work, as well as narratives that the students create from experiences of engaging with scientists in their local setting. Ko hai e Tokotaha Saienisi? 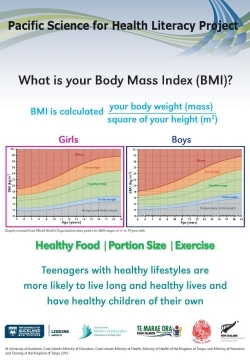 LENScience programmes support capability development that allows adolescents to grow into adults who seek out and use scientific and health evidence in every day decision making. Central to these capabilities is understanding of the Nature of Science (NOS) as well as science as a process and science as a knowledge system. Many of the LENScience learning resources are based around narratives that explore the work of scientists involved in research associated with life course approaches to the reduction of noncommunicable disease risk in communities. 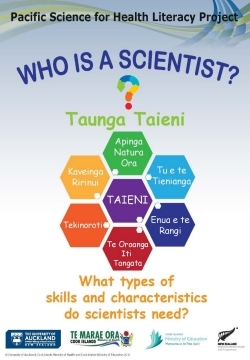 Developing understanding of the nature and process of science is enhanced by exploring actual research, as well of course as allowing young people hands on experiences of undertaking scientific research. 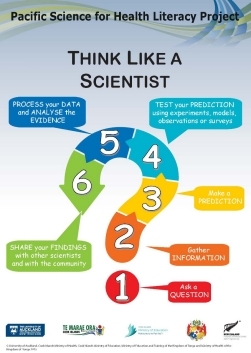 These posters support this ongoing theme throughout all LENScience programmes. 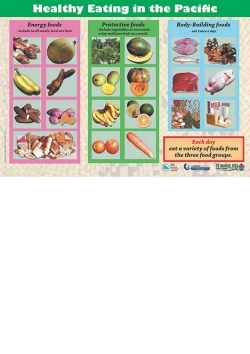 The healthy lifestyle posters and postcards have been developed from a combination of the LENScience Healthy Start to Life learning resources and resources from partners, particularly the Cook Islands Ministries of Health and Education. 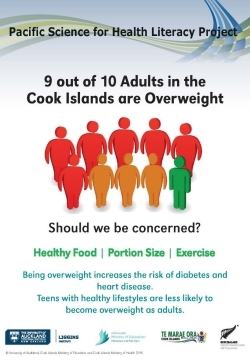 Through our partnership with the Cook Islands Ministry of Health, LENScience is very grateful to the Secretariat of the Pacific Community who have supplied posters for the project from their resources. 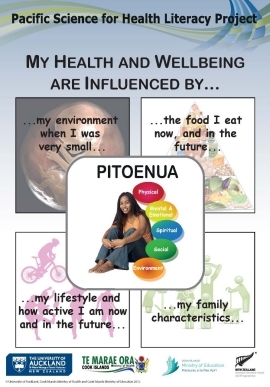 The postcard series are of particular note, and were initially developed by the Cook Islands Ministry of Education in response to the growing need to include an all of community response to supporting improved health and wellbeing throughout life for children and adolescents. 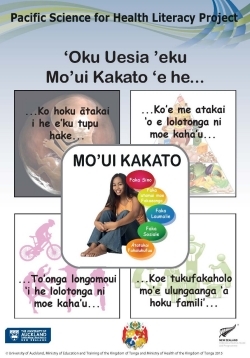 These resources have since been adapted by the Pacific Science for Health Literacy project team in Tonga and are available to download in English and or Tongan. They are designed to be postcard size, ideal for a reminder on the fridge door or family noticeboard! For printing at A2, A1 or A0 please download the 'FULL SIZE' version which has print marks for commercial printing. The 'SMALL' version does not have print marks and is suitable for A3 sized colour printing. The 'POSTCARD' version is provided where this is the intention of the resource. 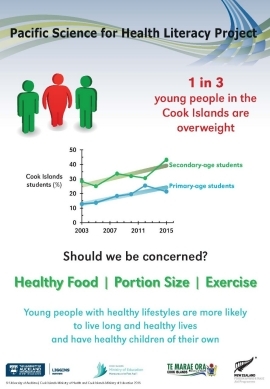 The "My Health Profile" posters have been developed in partnership with the Cook Islands Ministries of Education and Health. 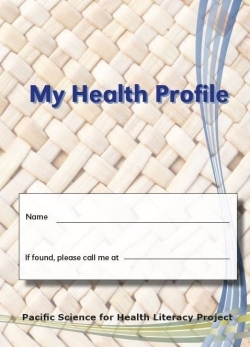 The "My Health Profile" resources were developed in response to secondary school students asking to know about their own health data. This followed classroom programmes exploring health evidence from the Cook Islands community. 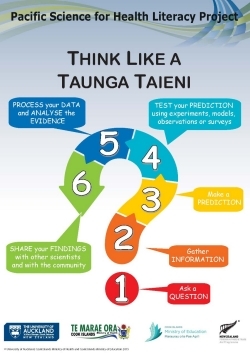 The resources have been developed by a team of education and public health professionals and have been tested with classes in Rarotonga. 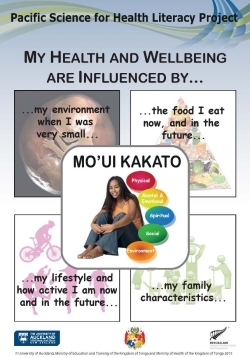 This poster series is designed to be used in conjunction with the Healthy Start to Life learning resources for middle and senior school classes as well as the "My Health Profile" learning resources. 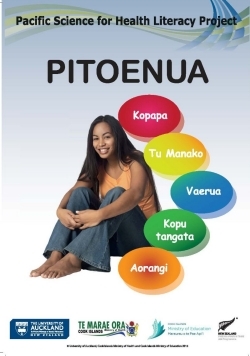 Students taking part in the testing of these resources provided positive feedback reflecting a desire to know more about their own health and wellbeing. They also provided feedback that reflected appreciation of the opportunity to spend time with nurses, and ask questions about their data. 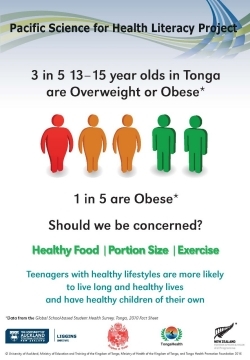 The awareness series posters have been developed in partnership with the Cook Islands Ministries of Education and Health, and Tonga Health Promotion. 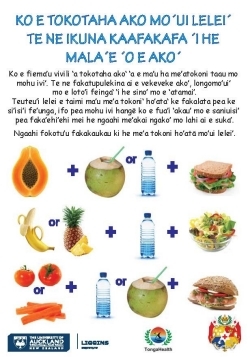 The teams working together, including teachers and public health professioanls identified a need for resources that could highlight the issue of NCDs in Cook Islands and Tongan communities and stimulate conversations in staff-rooms within the health and education sectors. 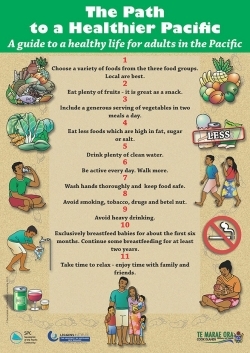 This poster series is designed for use with health and education professionals.They are supported by professional development workshops that examine the role of education-health partnerships in facilitating to school-based actions that contribute to reducing risk factors associated with noncommunicable diseases in children and young people.